Home CPD	Ghana – What’s the Point? Ghana – What’s the Point? Arriving at SOS Tema, was much like walking onto a holiday resort. Palm trees and terracotta roofs confused our understanding of where we really were. This village is home to over 160 orphans yet it looked like something out of a Thompson’s Select brochure. Our apartment was clean and spacious with everything we could possibly need and more. What the hell are we doing here? The SOS villages have been in existence for over forty years. Founded by Herman Gmerner, he had a vision to create a safe place, where orphaned children could experience family and education; no matter how poor their origins, they could be given a chance… he succeeded. Now there are many successful SOS villages around the world, serving the needs of the vulnerable. They have homes and a school on site. They are a success. A short walk from the most beautiful of the SOS villages, we visited a community school. The reality there is very different. Can you imagine teaching in a tiny, dust filled, cobwebbed room in 35-degree heat with fifty-two six-year-old children and goats running around your ankles? Me either! This is the reality of the community schools. SOS schools are highly successful in getting their students to pass exams. Whereas there are many community schools getting zero percent pass rates. In this short video, two community school teachers describe their classrooms. Alex Kekula was a child of the SOS villages. He now works in the central office for SOS and directs education practices across the schools. It is through Alex’s links with WWEP (and WWEP links with Independent Thinking) that we were brought here. Although proud of the work that SOS do, he knows that the divide between what they have and what the community schools are facing is unfair and avoidable. The hundreds of children cared for by SOS are better off than children with both of their parents living in their own home. How can that be fair?? 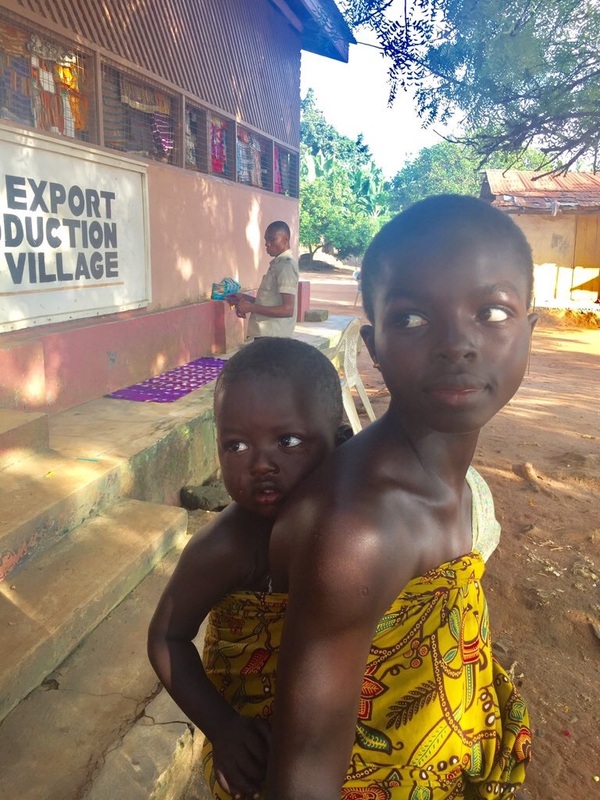 When we visited Bonwire, a local village, we got a taste of how local children live. No toilets, scruffy, covered in flies. Our guide, Seth Ampofo introduced us to a young man who was brought up in the SOS village. Once his schooling was over, he was returned to his home town to live. Imagine coming from such decadence back into such squalor. SOS stay in touch and ensure that he is supported but they cannot keep every child forever. Here in SOS, the children live in a home with their ‘mother.’ They are provided with food, clothing, brothers and sisters, a very good school and the potential to achieve their dreams. They are, in a way, spoiled. On our two-hour journey to Kumasi, we witnessed children, not in school but working alongside their adults. Girls washing and cleaning, boys pushing carts and selling whatever wares their surroundings provide them with. Some towns selling pots made of red earth and others corn, coconuts, clothes… The resourcefulness is quite astounding. Alex believes 85% of children are falling through the cracks and receiving no education at all. I wonder if I would turn up at a school that showed little ability to make a difference to my life. If I knew that I was likely to sell corn and coconuts like my father before me, why would I attend a school that had failed so many others who bothered to attend? These families know that the community schools are unlikely to help their children to pass; they lack the resources and necessary training. It seems more purposeful to have them at home, doing the jobs they are likely to grow up and do anyway. Ghana needs to grow from within to stop always having to look out. Education can take them there but a quality education for all, not a mediocre education for a select few. Alex knows how to make a change and it does not involve the British visitors coming here for the rest of time. In this first visit, we have trained teachers from both community and SOS schools together. This is the first step in creating a supportive community of teachers. When Crista and I leave, as happens in our own schools, the learning is forgotten as real life takes over. We asked teachers to plan and deliver lessons to each other while we were still here. We were able to observe practice and evaluate how well the teachers had understood the training provided. Working alongside Headmasters, we were also scouting a team of ASTs. Of course these teachers are unlikely to have the title or the pay rise that comes with such a role in England but they will be the start of Alex’s sustainable vision. The SOS villages will become Ghana’s teaching schools. At the moment, the teachers are not ready to do this. They need to hone their own teaching to really understand the pedagogy behind their success. That will provide them with clear and purposeful knowledge to pass onto their colleagues in the community. Next, they must learn to be coaches, trainers and leaders. Once they are ready, they will practice their skill through outreach work within the community schools, just as I did when I was working as an AST. Finally, they will become trainers of trainers so that they no longer need support from across the globe; they will grow their own skilled practitioners right here. The community school teachers, when they are ready, can become trainers and reach out further and further, growing and touching the lives of more and more children. Alex aims to reach 500,000 children through strategically growing successful schools. Alex moved from his own SOS Village in Liberia to America before returning to work within the SOS schools in Ghana. It is typical for Ghanaian students, who are highly successful, to leave their home behind and seek success elsewhere. Alex wants this to stop. As long as all of the educated talent keeps leaving the squalor behind, the squalor will remain. They need engineers to design solutions, doctors to care for the sick, politicians with integrity and wisdom, community workers, teachers, pharmacists and more, all of whom should focus on their immediate community…on Ghana. They want to ensure that the students who have been enriched by a quality education remain and see a future in their home. To improve teaching and learning in their community schools, they have asked visitors from England to support them but that is just the first step in a sustainable vision for improving education for all. We need to raise money to keep this work going, bring resources and support in the here and now. However, if Alex’s vision is realised (I can see it so clearly so I know it will be), Ghana can stop relying on hand outs and become the wonderful country it is meant to be.